The Cook's portrait starts out well enough, and then gets really disgusting. We learn that the Cook has a fairly decent repertoire of dishes and cooking techniques: he can cook a chicken in spices, or a stew, or pie, with the best of them, and like a good sommelier for beer, knows his London ale. Unfortunately, though, the Cook has a giant open sore on his leg. This is a shame, says Chaucer, because the Cook's blancmange, a white gelatinous dessert, is really good. What this probably means is that the sore on the Cook's leg resembles his blancmange. Not only does that make us not want to eat blancmange, it also puts us off whatever else the Cook might make; banging around the kitchen with a huge, puss-oozing sore on one's leg is not very sanitary, is it? The Host confirms our suspicions that the Cook does not run a clean kitchen when he takes him to task in his prologue for the number of flies that are loose in his kitchen, and implies that he's given many pilgrims food-poisoning. Moreover, says the Host, the Cook regularly sells stale meat-pies. And the Cook confirms the Host's accusations, telling him it's not a good joke if it's true! All-in-all, this is probably not a guy whose restaurant we'd want to frequent. With the Cook, then, we've got gross-out humor pure and simple. Bon appétit! The code and content is ©1996-2012 Anniina Jokinen. All Rights Reserved. What About Walter? Polity, Power, and Obedience in the Griselda Story - Peter Berek, et al. 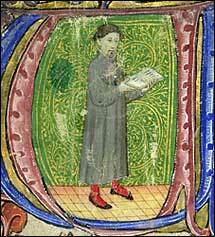 Medicine, aging and sexuality in Chaucer's "Reeve's Prologue," "Merchant's Tale"